Last week we went to Tuscany. My goodness! Where do I begin? The first thing to greet us was the grape-wine like lilac-colored wisteria, climbing every wall, every balcony, its fragrance perfuming the air, striking everyone in its command. We never tired of it, and we knew, even though we would expect rain showers instead of summer heat, that we had come at the right time. And then I saw a clump of orange-red poppies in a garden, and as we drove on busses to head to other towns, I saw them popping up like weeds by the sides of highways and country roads. I say they are in my top five flower list. So delicate, so fleeting too. I tried to capture one in a book, so that I could preserve the memories of its crimsonness, but alas, in vain. It turned purple. Where to eat in Tuscany? That was the question that our guidebook failed to answer us vegetarians. We relied on endless searches, reading menu after menu, to find our ideal meal. We never went wrong with gnocchi pomodoro (gnocchi in tomato sauce and mozzarella), or ravioli in the said sauce, or in sage butter. I tried all kinds of raviolis, and some had such a pronounced fresh ricotta flavor which I very much appreciated. Breakfast was slightly difficult because I was stuck in the New York brunch state of mind, but in Italy, they grab a slice of pizza or sandwich or pastry and eat it standing up! They drink their espresso standing up too! I mean, no thank you, I like sitting down and enjoying it slowly, which caused more searches for tables and chairs in morning hunger than was perhaps necessary. 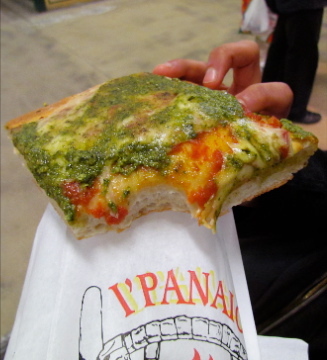 But alas, I gave in to their way and bought the most beautiful focaccia lathered with tomato sauce, then mozzarella, and then a generous splattering of pesto inside San Lorenzo Market, at a baker's stall in Florence. We ate it every day after we discovered it, sitting somewhere on a park bench or church step overlooking a piazza, it was just magical. My husband's favorite meal came in the form of a pesto lasagna in Oltrarno, on the less touristy side of Florence, paired with a local red wine. My favorite meal in Florence was the lemon gelato. You see, it was the whole experience. It was a beautiful sunny day, we walked over the Arno and climbed the steep hills of Oltrarno, towards a garden on a hill. There we saw lemon trees and tangerine trees, rosemary bushes, so many, just everywhere! We crushed the leaves of the lemon tree and reveled in the most delightful fragrance, a fragrance I would pay a heavy price for, but one that needs no price if one has a lemon tree. And as we climbed higher and got thirsty, we bought a lemon gelato, and sat in the grass under the sun overlooking Florence, and the hills beyond with the very tuscanesque cypress trees in the distance. We left our beautiful hotel Merlini, with its two walls covered with just windows, overlooking the cathedral, just like in A Room with a View, to go to Fiosole up in the hills of Florence. We paid just 2 euros to take a bus 20 minutes away, to a drastically different landscape. You could find stunning views, the most picturesque, the most romantic scene, out of a movie, with people trimming their olive groves and enjoying a spring morning. That's where we'll live one day. On a dedicated day, we bought our tickets to Uffici Museum online, saving us from standing in an hour-long line. It is the most beautiful museum I've been to: high ceilings with columns, statues from Greek and Roman times, stunning views of the Arno and the green hills above it, and mainly, for me, the beautiful art on the ceilings. It also houses the famous and most perfectly color-coordinated The Birth of Venus by Botticelli, and another work of his I appreciated very much, Primavera. After devoting four days to Florence, we went south to Siena and stayed at a cozy bed & breakfast. There we unexpectedly had our most favorite meal, as we explored the narrow streets with clothes hanging by the windowsills laden with spring flowers. The restaurant I speak of is called La Taverna di San Giuseppe: Via G. Dupre, 132 - 53100 Siena. We ate fresh pasta with pumpkin cubes, leeks, saffron, marjorim, thyme and grana padana. Sounds simple, but it was divine. And ribolitta: spinach, cabbage, cannellini beans, bread, onion and olive oil stew. It reminded me of my grandmother. We took a day trip to Monteciano, a quaint town known for its wine. We went there for the view, and it was stunning. We spotted an independent dog there, he was a lovely old soul. On our last day, we wandered the streets of Pisa in a torrential downpour. But I couldn't possibly regret it because it was during that time we took refuge in a gelatoria and ate the best gelato ever. An unassuming place, overlooking the Arno. I went for the strawberry cheesecake gelato, while my husband enjoyed a more sophisticated version of the lemon gelato, complete with lemon zest. I had a spiritual experience with my gelato, it took me back to India, to the flavor of malai kulfi -- cheesy rich ice cream. I begged for a clue, and the owner said it was mascarpone cheese. It turned out that this gelatoria used only organic ingredients, and one could easily tell. It really was better than all the others, and you must go there: Il Gelato: Lungamo Gambacorti, 13 - Pisa. A perfect end to a perfect trip, and where we will be going back to explore over and over again.